Most research on carbon content of trees has focused on temperate species, with less information existing for tropical trees and very little for tropical plantations. This study investigated factors affecting the carbon content of nineteen tropical plantation tree species of ages seven to twelve and compared carbon content of Khaya species from two ecozones in Ghana. For all sample trees, volume of the main stem, wood density, wood carbon (C) concentration and C content were determined. Estimated stem volume for the 12-year-old trees varied widely among species, from 0.01 to 1.04 m3, with main stem C content ranging from 3 to 205 kg. Wood density among species varied from 0.27 to 0.76 g cm−3, with faster growing species exhibiting lower density. Significant differences in wood density also occurred with position along the main stem. Carbon concentration also differed among tree species, ranging from 458 to 498 g kg−1. Differences among species in main stem C content largely reflected differences among species in estimated main stem volume, with values modified somewhat by wood density and C concentration. The use of species-specific wood density values was more important for ensuring accurate conversion of estimated stem volumes to C content than was the use of species-specific C concentrations. Significant differences in wood density did exist between Khaya species from the wet and moist semi-deciduous ecozones, suggesting climatic and site factors may also need to be considered. 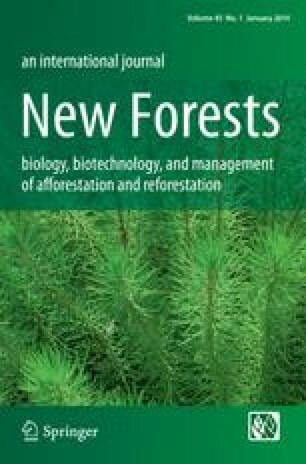 Wood densities for these plantation grown trees were lower than literature values reported for the same species in natural forests, suggesting that the application of data derived from natural forests could result in overestimation of the biomass and C content of trees of the same species grown in plantations. We would like to express our sincere appreciation to SamartexTimber and Plywood Limited (Samartex) for providing study locations and logistical support during sampling. We particularly acknowledge Richard Nsenkyire (General Manager), KKF Ghartey (Forestry Consultant) for their support at Samartex. We thank Crispin Suglo, Nelson Amelodze, G.K.A Acolatse, Lord Amenyaw, Sandra Owusu, and Millicent Obeng, field technicians and students at both the Forestry Research of Ghana and Samartex for their help in field data collection and lab support in Ghana. Jennifer Eikenberry and Emmanuel Ebanyenle of Michigan Technological University provided lab assistance and editorial support, respectively. The study was funded by the International Tropical Timber Organization, the Forestry Research Institute of Ghana, the Ecosystem Science Center at Michigan Technological University, and Michigan Technological University through the graduate research assistance training program.